A major clampdown has started against the press in Iran. Just over a week ago, sixteen publications, including twelve national dailies, were shut down by the authorities. These include almost all the reformist press, which started publication in the last three years. As a result, the whole reform movement has been muzzled. More than 1,500 journalists and press workers have been made jobless and newspaper circulation has been cut by almost half. At the same time, a number of journalists and publishers have been detained or imprisoned with arrest warrants going out for a number of others. A few weeks earlier, a leading journalist was shot and critically injured in a public assassination attempt in broad daylight. In the meantime, a draconian press law was rushed through the outgoing parliament, sponsored by deputies who have all but one had been rejected by the electorate in the February elections. The election itself, while heavily vetted to prevent any opposition politician from standing, has been dogged by the conservative-run supervisory council manipulating the results in a bid to alter the constitution of the new parliament in its own favor. As with any other act of political oppression, the free press is the first to fall victim. And in a society like Iran where independent political parties are virtually non-existent, the press has to take the major brunt of the attack. Political oppression may only succeed if the society is kept unaware of the words and deeds of the rulers. A free and independent press act as the eyes and ears of the people. It keeps a constant watch on the world outside and would give advance warning of what is coming up. In order to subjugate a society, it has to be made deaf and blind. It has to be denied of its free and independent press. The press in Iran has been tightly controlled since the early years after the Islamic revolution of 1979. However, over the last 2-3 years a degree of relaxation has allowed for a more vibrant and diverse press to emerge. There has been an explosion in terms of both quantity and quality of new publications hitting the newsstands. Over 35 dailies were being published until two weeks ago, most of which started life in the past three years. The range of topics being discussed has been more exciting. Mundane subjects, hitherto regarded as taboo, were being gradually introduced into the debate - from human rights and civil society, to questions of separation of state and religion, to the will of the people being the source of power. This new press, however, by no means could be classified as "free" or "independent". First of all, publishing activity in Iran is regarded not a as a right but as a privilege. The privilege is granted to people who have proved their loyalty to the religious political establishment. This is done through a licensing system. A government-appointed supervisory body vets all applications, and approves only those coming from people it finds suitable for the job. Applications coming form people associated with political opposition are rejected outright. Even then, the process is far from fair and impartial. In practice you may have no chance of being granted a license if you do not follow the right political or religious creeds. We just heard in a conference in Berlin last month how some applicants have been waiting for a license to produce a periodical on social issues for several months while in the meantime scores of other licenses had been issued to people favored by the authorities. It is therefore no surprise that almost all of the 35 or so national dailies have been affiliated to the warring factions inside the establishment: many are owned and/or edited by people who have worked or are working in the government, the military or the intelligence organizations. Then there is the question of who could or should have access to these newspapers. While some liberal-minded publishers and editors allow secular writers and journalists to work for or write in their papers, they do so at their own peril. They have to be careful not to raise the authorities' anger by allowing unreconstructed political opponents of the regime to write in their publications, no matter how mundane or apolitical the topic may be. There is also the question of 'red lines' ­ borderlines that nobody is allowed to cross. Some of these red lines are defined by various laws, but some are undefined and unwritten. And this is where most publishers fell foul of the authorities. The judiciary system in Iran is under the control of the conservative religious authorities and works more according to the whims of the judges than by laws. Moreover, in Iranian courts, the judge and the prosecutor are the same person. An offending article, either because of content or its writer, could result in a court summon being promptly issued for the publisher, editor and/or the writer, who would appear before a judge with powers to impose hefty fines, issue long prison sentences and/or suspend publications. And though by law press offenses have to be tried in the presence of a jury, this is no guarantee for a fair hearing. The jurors are appointed either by a government committee or by the judge himself (judges being always male), and even then their verdict may be disregarded by the judge altogether. Moreover, in some instances, the judge may decide not to call a jury at all! These peculiar practices are best exemplified by the case of daily Neshat with which I was personally involved. As a dissident writer and journalist, I have been denied writing in the Iranian papers for many years. However, and after several attempts, last year I managed to publish a few commentaries in the daily Neshat ­ all on human rights issues, an area that I have been involved with since the mid eighties. But when my third commentary appeared, in which I argued against the death penalty, a huge outcry started. Some religious leaders interpreted this as taking a position against Islamic laws regarding vengeance (even though I had made no reference to these or any other religious laws in the article), and the hardliners used this as an excuse to put pressure on the paper. The paper had apparently crossed an invisible 'red line'. Then they realized that the piece had been written by an exiled journalist who by definition should have had no access to the Iranian papers. This was no less of a crime. In the eyes of the Iranian hardliners the society was divided between the 'insiders' and 'outsiders'. They would tolerate the reformists as long as they did not mix with the outsiders ­ dissidents, secular writers and journalists, political opponents, and anyone who had been at the receiving end of the widespread oppressions in the past two decades or who had managed to get out of Iran in fear of their lives. Here, the paper had broken this unwritten second rule: allowing an exiled journalist to write on a humanitarian issue: the death penalty. Soon the paper was shut ­ even though it had apologized for both the content of the article and the fact that the paper had published a piece by an exiled journalist. A virtual death sentence was issued against me for the 'crime' of calling for an end to the inhuman practice of capital punishment, and a bounty declared on my head. In the eyes of the hardliners running the government in Iran, someone who defends life and opposes the death penalty deserves to die. Few weeks later the publisher was on trial. He was charged with various offenses including offenses against Islam for questioning the death penalty. He received two-and-a-half-year sentence. But that was not enough. The courts also summoned the chief editor ­ even though according to the press law only the publisher is responsible for whatever appears in the paper. The courts had to invoke pre-revolutionary laws to try and convict the editor. And in doing so, they decided that they did not need the services of the official jury either. He too received a two-and-a-half-year sentence. Both these gentlemen were taken to prison in the last few weeks to serve their sentences. And last week came the sweeping suspension of almost all of the reformist and independent publications ­ some with the highest circulation in the land. On what legal basis, one might ask? 'Crime prevention'. Yes, the judiciary has discovered a pre-revolutionary law, which states that 'in order to prevent the repetition of a crime by known dangerous criminals' a court 'may confiscate their means of crime' ­ a reference to the confiscation of dangerous weapons carried on by previously convicted criminals. In other words, though few if any of the newspaper publishers have ever been convicted of any offense, they are being viewed as dangerous criminals. Moreover, publishing materials and newspapers are not merely the innocuous means of communication or tools for cultural discourse, but dangerous weapons threatening the good of the society. And in order to prevent that from happening, they should all be shut. It is as if one person uses his tongue to lie, all tongues have to be cut. And this, more or less, sums up the attitude of hardliners towards the press in Iran. 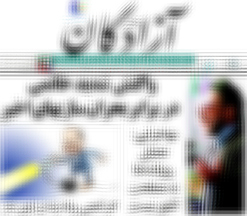 The sudden closure of the reformist newspapers has deprived the movement of its main vehicle of reform. The clampdown on the press has also come at the time when critical political events are taking shape. Four major trials are in progress, one of 13 Jews accused of spying, and three others in which various agents of the regime who have been implicated in killing of dissidents, attempted assassination and violent attacks on university students are being tried. All these court proceedings are viewed with suspicion of either a fix in the case of Jews, or cover-ups in the case of others. Also, the second round of parliamentary elections is underway. Hardliners were defeated heavily in the first round. The press had to be muzzled so that these events could take place away from public scrutiny. We are living through some of the darkest days in the history of Iranian journalism. It may also prove to be the defining point for the democratic movement in Iran. The nation is holding its breath. Hossein Bagher Zadeh is a member of the steering committee of the Iranian Human Rights Working Group. He delivered this speech at the seminar on Worldwide Freedom of Press (3-5 May, 2000) in Barcelona, Spain.